Second-year mechanical engineering technology students Tim Brogan (left) and Ryan Strand used tablet PCs as part of a pneumatics and hydraulics course. They were part of a study to determine how use of educational technology might enhance learning, improve interaction and engagement with classmates and faculty and decrease withdrawal rates from the course. Researchers at Rochester Institute of Technology have found that use of a technology-rich learning environment in several undergraduate engineering-technology courses has improved learning and decreased withdrawals from, or failing grades in, the courses. 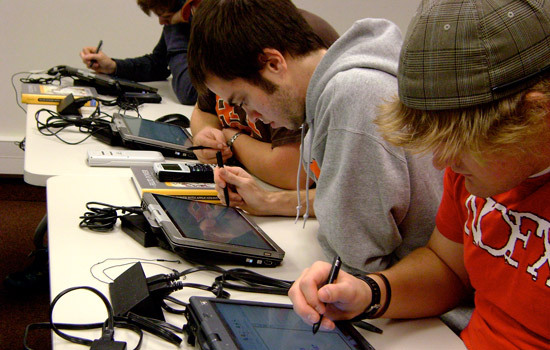 They found that more than 90 percent of students involved stated that using the technology-rich environment—which includes a combination of tablet PCs, collaborative software, and multiple projection screens capable of capturing and retaining graphics and notations—helped them learn and retain the information better than traditional classroom lectures. The data came from six years of research involving more than 500 undergraduate students in 12 class sections taught by three different mechanical engineering technology faculty: Robert Garrick, associate professor, Larry Villasmil, assistant professor, and Diane Amuso, a lecturer, all from RIT’s College of Applied Science and Technology. Three engineering technology courses that had low retention rates and higher-than-average rates of student withdrawals were targeted—pneumatics and hydraulics, applied dynamics and applied fluid mechanics. These are foundation courses for engineering-technology degree programs. In one class specifically, nearly 23 percent of the students enrolled previously received low or failing grades and had to repeat or withdraw from the course. Researchers re-designed the courses to include a tablet PC for each student and DyKnow collaborative software. Classes took place in an interactive technology classroom that featured a multiscreen display connected to faculty and student tablet PCs. Class information and any notations were captured, recorded and archived. The combination of these resources improved the visual connection to the material and the student-faculty interaction, and it enhanced the modeling of engineering problems, three areas seen as critical to retaining the technical information, Villasmil explains. In a traditional laboratory setting, students work at different workstations while the instructor walks around, answers questions and reviews circuit operations. In the new technology-rich environment, students viewed multimedia lectures and virtually assembled electrical circuits and tested pneumatic or hydraulic systems. Instructors reviewed the submitted work in real-time, highlighted the different approaches and identified problems. All student work is added to the archive on the tablets so that multiple approaches to the problems can be referenced. The project is funded by a grant from the National Science Foundation’s Research Initiation Enhanced Engineering Education and Engagement program. Joining Garrick, Villasmil and Amuso on the research team were Elizabeth Dell, assistant professor of manufacturing and mechanical engineering technology, College of Applied Science and Technology; Margaret Bailey, professor of mechanical engineering, Kate Gleason College of Engineering; Rhiannon Hart, assistant professor of psychology, College of Liberal Arts; and Nancy Ares, associate professor of teaching and curriculum, University of Rochester Warner School of Education. The team will continue to look at how a technology-rich environment may impact the educational experiences of underrepresented groups, especially deaf and hard-of-hearing students who make up approximately 10 percent of the students in engineering technology courses, yet who have higher than average withdrawal rates.